Brie baked in puffed pastry…basically, a buttery cheese wrapped in a buttery crust. How can that not be delicious? In this version, I wanted to bring in the flavors of cherry and almonds. Creamy brie cheese is covered in cherry preserves, toasted almonds, and brown sugar, and then baked in a buttery, flaky crust, a bit of sweet, nutty goodness just waiting to be unwrapped. 2. In a small bowl, mix the preserves and almond extract. 3. 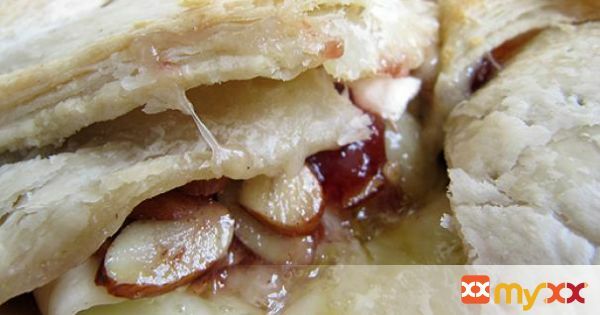 Place brie wedge in puff pastry and drizzle the preserve and almond extract mixture. 4. Sprinkle brown sugar and almonds on top and wrap in the puff pastry. 5. In a small bowl, whisk the egg and water and brush the egg mixture onto the pastry. 6. Bake for 25 minutes, or until the puff pastry turns golden brown. 7. Serve with fruit slices, crackers, baguette, or whatever floats your boat.